Recently saved from threatened closure, Shoreditch's independent cultural centre houses three cinema screens alongside exhibition and performance spaces and a cafe/bar. Run as a charity, it's a vibrant arts hub and any given week could see it hosting an assortment of music gigs, theatre shows, art exhibitions, themed festivals and all manner of workshops. Families are well catered for with weekly parent and baby cinema screenings of the latest films, a family cinema club with affordable tickets and the fortnightly Wiggly Jigglers active play session for under-twos. Local residents with a Tower Hamlets Libraries or Ideas Store card get discounted entry to cinema screenings. My friends brought me here for a Palestinian rap concert!what a fun evening that turned out to be!! Its a great location for concerts and gatherings! There's a bar inside too with very resonably priced drinks!! I would happily go back here for future sets and shows! Rich mix has a lot more to offer than meets the eye. What I thought was just a small cinema is actually a really cool independent space that holds all kinds of events from being able to be hired out for private functions as well as interesting events like the moth story telling series. We popped in to use the discount Monday cinema offer where you can see a movie for £6! Yes in shoreditch! Just like all those picture houses etc it has a nice little bar offering wines and popcorn for normal prices too. Cheap tickets, comfortable seats and generally nice atmosphere means I’ll be returning soon. 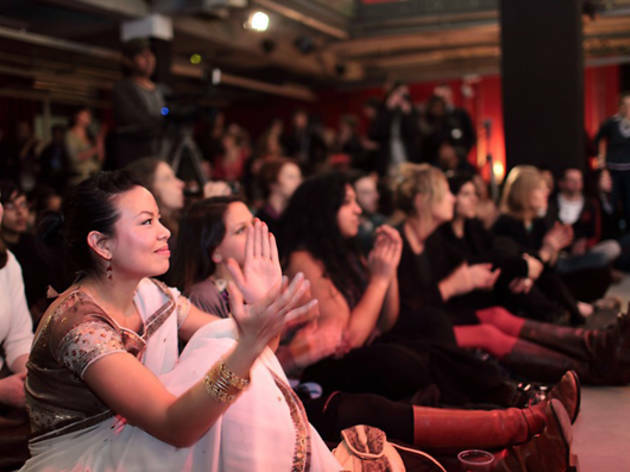 Rich Mix is a great creative venue tucked just off Shoreditch High Street that continually opens its doors to a huge range of culturally diverse events. A licenced bar makes it great for club/music/evening events while the cinema is nice and quiet - perfect for catching that must-see film without the crowds/prices of/sticky popcorn floor of an Odeon. And, if you grab a Rich Mix card (which is £6) will get you a set of free cinema tickets (ergo, it's paid for itself already) and then £6 cinema tickets for a year. It's a no-brainer. Verdict: great all-rounder venue that you should definitely hit up on a free Sunday, you'll never know what will be going on! Rich Mix is a flexible, interesting venue, very handily located less than 100metres from Shoreditch High Street Overground Station. It has a theatre space and a bar on the 4th floor, holding around 100 people comfortably. The ground floor has a licensed bar in a space suitable for live music holding many more. There are three cinema screens on the floors in between and there is also an Indian restaurant/café on the premises. What really makes this venue, is the variety and diversity of the cultural events that are put on here. If you look at the programme for the coming month alone, there is theatre, dance, live bands, open mic nights, story-telling evenings, political events, family events, not to mention the films showing in the cinema, where it is one of the venues hosting the London Film Festival. A great venue, enhancing London's rich cultural diversity. Brilliant central location specialising in the creative arts but also has a number of cinema screens. I attended a showing specifically for Parents and Babies which occurs once a week (Monday at 12pm). Really lovely to do a normal adult activity with the safety of being able to feed, bounce, change or tend to your baby too. The film's projectionist introduced himself prior to the movie starting and explained how the lights and volumes are specifically altered for this particular group. He also made himself available for the first five minutes of the film in case you had any particular concerns or requests. Only £6 a ticket, I would highly recommend this activity to new parents who need a safe place to enjoy the latest blockbusters. This is one of those venues I'm happy to follow on social media and follow their newsletter, they have such a wonderful variety of events, films and much more! A great cultural centre with live shows, exhibitions and a great modern cinema. Great value for money. Ticketing staff are not the most helpful when cinema seats are double booked refunds are reluctant and free tickets seem not to be redeemable although staff cannot explain why. this is the most diverse and amazing venue that reaches out to many voices in the rich communities around them. always daring and always doing great things. big up the richmix. Brings both mainstream & upmarket / indie releases to an eclectic, East End audience. An important mainstay of independent halls, in the ever-changing London cinema landscape. You can't go to any other venue in London and jump from a grime night, to classical indian dance, drop into a political debate and whirl around visual art celebrating queer diversity and Arab-British identity. Oh and there's a cinema too. Just in case you didn't fancy any of the above. Rich Mix is a venue at the end of Brick Lane that does events as well as being an affordable cinema. I’d been there before to play ping pong with some friends, but this one time my flatmate and I went there to see Nymphomaniac volume one and two, as well as a live Q&A with some of the cast members in Chelsea. The theatre rooms have a lot of characters. The screen we were in front of had really cool walls and ceiling which I only got to see at the beginning of the show. The nearest bathrooms are a little far away, so go before the film so you don’t miss anything. Watching Nymphomaniac was an experience in itself, it was really interesting and eye opening so it didn’t really matter where I was watching it. But I’m grateful I got to watch it in a comfy chair without any distractions. They do some really special screenings, this is an amazing independent venue. So much more than a cinema, Rich Mix is at the heart of the community on the western edge of Bethnal Green. It hosts events such as the recent Philosophy Football 'Days of Hope', a day of activities celebrating the contributions of post-war development to building a new world. They also have an excellent café! Rich Mix shows great films, has some seriously good live music, and then there's the theatre, the dance, the comedy, spoken word and the exhibitions! This venue hosted the Festival of First Nations which reached out to, and gave insights into, cultures throughout the world. It's an inspirational place, an entertainment place, and so much more. Great place to eat and drink, watch films and watch live performances from artists from all over the world. The Rich Mix also offer great workshops for teens helping them to develop skills and showcase their learning to the public. Every form of entertainment for the whole family under one roof. What more could you want! Great venue that provides cinema, theatre, concert venue and restaurant all under one roof. I have always enjoyed coming to this venue, and it continues to grow in leaps and bounds in what it does. It's part of film festivals, music festivals, and close to all the on trend places in east London. Love it!! This Arts Foundation venue is an excellent platform for entrepreneurship, professional development, creative skills/performances and art-inspired activities. The Cinemas and Event areas are spacious and well equipped as well! This is truly an incredibly unique venue as far as London goes, let alone Shoreditch. It genuinely serves its local community, ensuring that a vibrant array of cultural events are both affordable and relevant to the whole of the local community, not just the more affluent hipster benefactors of the gentrification that inevitably seeps into and commodifies all culturally interesting areas of London. Rich Mix is East London’s best independent arts venue. Truly inspirational venue - culture, politics, music, dancing and an awesome atmosphere - stands out in a sea of gentrified hipsterfied so-cool-you've-never-heard of it nonsense as a place with real soul rather than a [dis]affected attempt at soul. Come along to one of their more politics nights and get your mind blown! Great place - always something interesting going on in the performance space when I am heading for a film. Bar isn't bad either. Excellent community venue where you can enjoy first class performance and a delicious Indian lunch or dinner.